Just after the recent market corrections and volatility spikes, important debates are arising again. The stress observed lately in the markets clearly indicates that we are on the verge of a global regime change. We are progressively abandoning the era of zero rates and “easy money”, which has anesthetized investors, pushing them to take more and more risk, and bringing asset values to unprecedented levels. Such a transition cannot be smooth; it will certainly mean a lot more nervousness and volatility in the markets. Even if most specialists tend to be reassuring, seeing in the recent market turmoil episode a “natural” and even “salutary” correction, institutional investors such as pension funds cannot ignore the shift and will need to reconsider their investment approach in terms of asset allocation and portfolio construction. Pension funds will have to look for new sources of return, both on the bond and equity sides. In the fixed income universe, in a context of potential rising rates, the flexibility of asset allocation will be key in order to grasp opportunities where they stand, whether they lie in taking advantage of yield curves discrepancies or in seizing liquidity premia from assets at the far end of the liquidity continuum (e.g. : leveraged loan, private debt). When it comes to equity, the new sources of return are likely to be found in active volatility management strategies and factor investing approaches. Transcending the bond and equity boundary, pension funds should also consider strengthening their position in emerging markets, given their performance potential, provided the stock picking is highly selective. Last but not least, in the new era to come, ESG strategies will become essential in a long-term investor’s asset allocation. Not only are they a good way to mitigate long-term risks, such as climate risk, but they also represent a good opportunity to get extra returns. This search for new sources of performance will naturally lead to a re-appropriation by pension funds of fundamental rules regarding portfolio construction to deliver results in accordance with their liabilities and funding constraints, as well as beneficiaries’ expectations. The optimization of portfolio construction is intrinsically linked to an increasing integration of risk management considerations, in particular risk factors, which should help pension funds to select investments with a rewarding risk factor profile. As pension funds enter this new era of enhanced volatility and unpredictability, they are also likely to increase their holding periods in order to allow risk premia to materialize, as it has been highlighted in the latest edition of the Create survey, interrogating more than 160 pension plans over Europe. The underlying of such a move is the hunt for long-term opportunities as well as a permanent search for efficient diversification and hedging strategies to face long-term challenges. Time horizon is not the only criterion to take into account for pension funds when addressing their beneficiaries’ needs in the current shifting environment. In order to adapt to the growing work flexibility and mobility of their beneficiaries, they also have to integrate the geographic dimension in their set-up. To answer this need, large asset managers have developed cross-border solutions for pan-European pension schemes, enabling them to go beyond physical boundaries and local regulatory constraints. Lower expected returns, possible volatility fertilizers and tight valuations are among the challenges that will require investors to rethink their investment strategies. 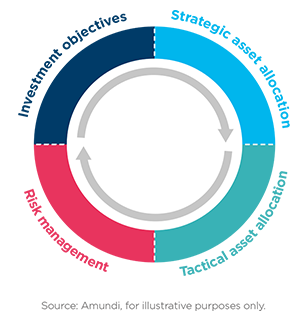 Over the next decade, we believe that returns from traditional asset classes will change dramatically compared to the past. The return for a global balanced portfolio (50% invested in global aggregate bond and 50% in global equity) could drop from the annualised 8%1 recorded after the GFC to an estimated 4.5%, assuming an average 2% dividend yield, 5% earnings growth and 2% of bond yield to maturity, and keeping Price to Earnings ratio (P/E) unchanged. So, unless good exogenous news on growth or additional monetary stimulus materialises, which could further drive P/E expansion (and we think this is unlikely at this stage), it becomes relevant to rethink how to increase returns both on the equity and the bond components. To do that, we believe that investors can enjoy multiple sources of potential extra performance, such as: access to opportunities across all the liquidity spectrum, factor investing, alpha2 generation, in particular in markets that are still inefficient (such as EM, Japan or small-mid cap companies), and by exploiting the potential of long-term growth themes as well. The inclusion of ESG as a risk factor will also be paramount, in our view. ESG investing could allow investors to both reduce risks that are not negligible, such as carbon risk3, and identify long-term opportunities that could best address the challenges raised by new regulations, as well as consumers’ and investors’ habits. In addition to searching for new sources of returns, investors should also consider how best to optimise portfolio construction to manage future changes in the risk environment. Alongside the lower expected returns, we also see increasing sources of risk that could potentially lead to higher volatility and losses that at some point could trigger strong negative reactions from loss-averse investors. Consequently, investors should assess each portfolio component on the basis of its potential gain or loss profile in each of the three possible scenarios. In order to do this, we think it is key to analyse each investment exposure to different risk factors (i.e., growth, inflation, interest rates). For example, currencies could be played to gain exposure to certain interest rate dynamics or as a hedge against phases of market turmoil. The first investment paradigm is about the overall redesign of the portfolio construction around a new risk framework and with a multi-scenarios approach. In our view, investors should reconsider the traditional risk/return framework, taking into consideration the new emerging risk profiles of the different asset classes and their risk factor exposures to the different scenarios. Looking towards the future, government bonds appear riskier than in the past, as the index duration is at all-time highs and the low level of coupons in certain areas of the market may not be sufficient to absorb even small rises in interest rates. This is a substantial difference from what happened in other bear bond market episodes (’60s and ’90s), where coupon acted as a partial shock absorber, limiting portfolio losses. On the other side, structurally low levels of interest rates, combined with solid earnings growth, make equity valuations more sustainable in the long-term. Overall, this translates into a change in the efficient frontier (shifting down and steepening as a result of a worsening outlook for government bonds and lower expected returns) that requires a reassessment of strategic asset allocation, which could otherwise be suboptimal in this new environment. A barbell allocation to cash (as a risk-free safe asset to manage the portfolio liquidity profile and to address tactical opportunities) and to risk/growth opportunities could help to maximise return potential and manage the portfolio liquidity profile, as the risk/return profile of core government bonds looks highly unattractive. In defining their risk allocation, investors should consider that the so-called “risky” assets (especially equities) could be less risky than previously thought. This allocation should also gain on exposure to factors that could best benefit in the different scenarios (i.e., growth or inflation vs interest rates). In this view, equities could be considered less risky than credit. Credit markets – the great winners in the search for yield led by CBs – are progressively showing asymmetric risk: default rates are close to zero, credit fundamentals are deteriorating (especially in the lowergrade ratings) and the end of excessive monetary policy could put pressure on the asset class as liquidity could suddenly dry up. To enhance yields, potential bond investors should look for opportunities across the full credit space. For example, appealing yields are still available in the EM space, but this area also requires a careful assessment to avoid securities most exposed to rising rates and/or default risk, pointing to the need for a stronger focus on selection. The last important allocation investors should consider is to diversifiers: mainly liquid alternatives or illiquid real assets. This could help to enhance portfolio diversification and return potential by capturing the idiosyncratic alpha thanks to the manager skills or the liquidity premium. However, to avoid to pile up risk, allocation to alternatives should be strongly focused on manager selection and should consider the different risk factors that these assets are exposed to (i.e., interest rates and yields for real estate, infrastructure and private debt or growth for private equity). Equities are set to be among the most relevant sources of performance in the future for a balanced portfolio, although they could deliver lower returns compared to the past decade. To address this challenge, we believe that investors should try to exploit all the opportunities available in the various scenarios, relying on all the different equity investing approaches at their disposal. In a great moderation regime, where synchronised global growth continues, we see a continuation in earnings growth in all major regions that still supports some directional views on equity markets, in particular where fiscal policy changes can provide a further boost to be played both through an active management approach (to select stocks most benefiting from these changes) and with cost effective instruments to quickly adapt to changing conditions. However, as we start moving towards a regime shift, equity investing should focus on mitigating possible phases of high volatility and on increasing the overall return potential. Factor investing and active management are set to become increasingly relevant in this respect. As the regime shift eventually starts to materialise, active management could find more fertile ground – for instance, by selecting those stocks likely to benefit in a rising rates environment and in case of inflation surprises, should a back to ’70s risk scenario emerge. Factor investing will also be increasingly relevant in order to gain exposure to well remunerated factors, to avoid the factors that will remain unrewarded, and to approach new factors, such as ESG. In our view, ESG investing will play a relevant role in avoiding areas of risk and in identifying long-term opportunities with a discrete probability of occurrence, also benefiting from increasing investor appetite. What are my primary equity investment objectives? How do I pursue my long-term goals? How do I play tactical views on the economic cycle? Allocation to active managers able to best exploit the specific cycle opportunities. Increase allocation to manager skilled in downside risk mitigation. The third investment paradigm is about the redesign of fixed income investing. While in the past investors have handled the fixed income market with a building block approach to the different segments, we believe that a flexible multi-sector approach able to exploit opportunities across the full credit spectrum and liquidity continuum will be needed in the future. With yields now at historical lows and risk piling up in the fixed income market, the bond component should be shaped around three main guidelines in order to enhance the risk/ return profile of a pure fixed income or of a balanced portfolio. 1. Adopt a flexible approach to manage interest rate risk. Central Banks have distorted government bond markets in developed countries after the Great Financial Crisis. Duration in bond indexes is at an all-time high and overall debt is higher than ever. For bonds, we are not expecting rates to grow rapidly and be significantly higher than current levels, and we reiterate our view of low interest rates at equilibrium (the Fed’s recent downward revision of the terminal rate, because of demographic factors and lower productivity, is supporting this view). However, we believe that with stronger economic growth and inflation closer to CB targets, CBs will find themselves offside and behind the curve. This could mean a scenario of rising rates, with possible sudden rises in yields (a scenario similar to 1994 cannot be ruled out) and significant capital losses for investors in a framework of reduced liquidity and lower cushion provided by coupons. However, this spike in yields could be temporary, as at the same time, structural trends, such as demographics (although questionable), regulation and excess of savings with a bias for safe assets (more and more scarce), should continue to keep yields low. In addition, the risk of a US cyclical downturn in growth in the medium-term (18/24 months) remains and could start to kick in as soon as the business cycle becomes mature. In thistug of war between upside and downside forces on interest rates, duration management will be crucial. If we add different speeds in normalisation of monetary policies to this scenario (US in a more advanced phase than the Euro zone and Japan), we could see yield curve movements offering opportunities for flexible management in curve buckets (steepening/ flattening), cross country spreads (i.e., Treasury vs Bund) and currency exposure. 2. Exploit opportunities across the liquidity continuum. A way to enhance returns in fixed income investing is to search for value across the full investment universe (i.e., from listed investment grade to leveraged loans, to private debt). In this way, investors with the appropriate investment horizon can look beyond traditional boundaries again (by approaching both the public and private spaces, with different degrees of liquidity), by focusing on assets with bond features and equity-like returns and by managing liquidity risk effectively. 3. Play the ESG factor in bonds. The increasing investor appetite in sustainability themes is a key trend that is also reshaping the bond sector. For instance, green bonds to finance sustainable projects continue to see strong demand. As the market becomes more mature and standardised, issuance should accelerate further to finance global infrastructure – needed to meet emission reduction targets, especially in EMs – and this could tap into the rising demand, especially from institutional investors facing increasing regulation on climate-related risks. In our view, EMs are a long-term opportunity and investors should structurally increase their weight in the portfolios. 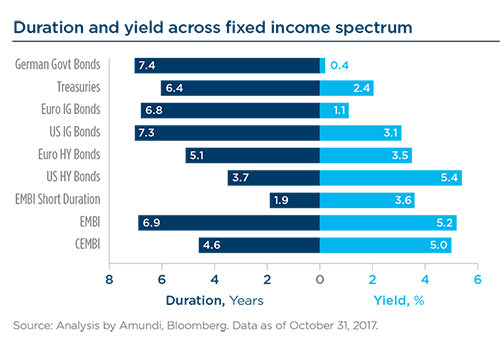 In fact, for example the EM equity asset class is still underrepresented in investors’ portfolios (5% of average equity allocation in institutional portfolios vs 12% of EM market cap on world market cap, and a 58% share of GDP)4 with room to grow. We base our conviction on a combination of short- and long-term trends. On a tactical basis, EM asset classes are well supported by stronger and synchronised global growth, a stabilisation of the commodity cycle, and easing financial conditions. In many situations, looking at risk premia in both the equity and debt spaces, investors are still well rewarded for the risk of further depreciation of currencies. On a structural basis, we see progress thanks to ongoing structural reforms (digitalisation, urbanisation and liberalisation of financial markets), which should in turn help the transition of the economic model of many EMs from export/investmentled to internal demand-driven model (more sustainable). This transition is already reflected in the falling weight of old economy sectors (energy and material) in EM equity indices, counterbalanced by new economy themes (IT). Given the current economic growth, many companies in EMs have taken the chance to restructure their business models, cutting costs and improving governance standards, and this is translating into higher earnings growth. Consequently, international investors are getting more comfortable with investing in these assets. In our view, these trends will drive a structural catch-up of EM investing vs DM, but some areas of risk will remain. A key area to watch on a structural basis will be the resilience of the Chinese backdrop and the ability to manage the economic transition, the currency credibility and the management of the debt issue without major disruption. All the previous developments clearly point to the need to remap the EM universe, going beyond geographical frontiers and focusing on macro drivers and vulnerabilities for each country. In fact, countries are at different stages in the transformation process, with different stability conditions (i.e., reserves, current account) as well as varying levels of room for manoeuvre in terms of fiscal and monetary policies, electoral cycles and reform impulses. This makes us more comfortable in approaching EMs on a selective basis, focusing on a combination of top-down analysis at the single country level with a bottom-up focus at security level. In our view, the ability to approach EM investing in an integrated way (bond and equity) will also become a distinctive factor in order to understand full capital structure of companies and to address macro and micro dynamics, both relevant when assessing EMs. 1. 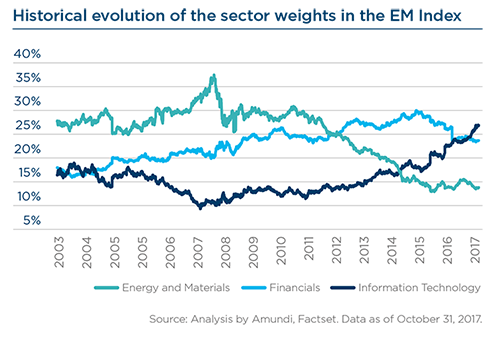 Amundi analysis on the annualized return over the period from 31 March 2009 to 31 October 2017 of a 50% MSCI AC World Net Total Return Index and 50% Bloomberg Barclays Global- Aggregate Total Return Index. Nominal returns before fees and taxes. 2. Alpha measures risk-adjusted performance, representing excess return relative to the return of the benchmark. A positive alpha suggests risk-adjusted value added by the manager versus the index. 3. Financial risk related to the companies carbon footprint and carbon exposure. 4. Mercer European Asset Allocation Survey on European pension funds industry, 2017. Before the dawn of populism, as excess liquidity bloated asset prices without stoking inflation, pension plans’ interest in long-term investing had waned somewhat. Equities: ‘increased’ 21%, ‘decreased’ 24%. Bonds: ‘increased’ 17%, ‘decreased’ 31%. Alternatives: ‘increased’ 21%, ‘decreased’ 16%. However, with the rise of populism, sentiment has duly shifted (Figure 1.1). 44% now report that the importance of long-term investing will ‘rise’, 48% expect it to remain ‘unchanged’ and only 8% expect it to ‘fall’. Underpinning these results is the belief that lower portfolio turnover will deliver better results and lower costs. Long-term investing has come to the fore as political events and their impacts have proved difficult to predict. The implied support for buy-and-hold investing does not necessarily mean hanging on to a position, come what may. For example, for equities, it means ensuring that current valuations factor in the fundamentals. If the current price is higher than the discounted price, the asset may be sold and only repurchased when the situation is reversed. following the herd is inadvisable (41%). These principles are inter-related. They convey four messages about markets as they transition to a new phase. First, high volatility will be the norm. Timing the market is a fool’s errand. Few pension plans have the skills and nimbleness to engage in it. Depending upon how the political risks pan out, markets could get as volatile as they did during 2011-13, when the Eurozone crisis roiled them for extended periods and left them directionless. Second, diversification will remain essential. The key will be to identify new risks and hedge them via a broad palette of assets. Pension plans are in the cross hairs. Aging member demographics call for rapid de-risking. But that is not viable while the majority of pension plans have funding deficits. The key difference from the past will be a shift from asset classes to risk factors, as ever more pension plans resort to risk factor investing. The way diversification – based on asset classes – has been implemented over the last thirty years has rarely been consistent with the objective of adding value because of the rising asset class correlations. Good returns were often more a matter of luck than judgement. Third, asset class returns will remain volatile and unpredictable. Hence investors have to increase their holding periods to allow risk premia to materialise. This argument in favour of longer holding periods is also supported by the belief that mean reversion is not dead. It will continue to apply to both markets as well as asset classes. The latest MiFiD regime will lend fresh impetus to long-term investing via total transparency around fees and charges. Interestingly, high conviction investing is unlikely to command more attention from only 30%. That is because asset class returns will remain volatile. Additionally, the rise of systemic strategies like smart beta and ETFs will attract fresh assets from active investing. Finally, our overall results imply a changing emphasis on different principles rather than on radical departures. Even momentum investing, long frowned upon, will be favoured to some extent by 60% – when it is working. While putting more emphasis on certain principles, pension plans have not shut the door on others. It’s all a matter of what works in a dynamic environment. There are no all-weather strategies. Historically, pension plans have relied on the time-honoured equity risk premium (ERP) as a weathervane for investors’ hopes and fears. Now, they can no longer do so, since the notion of ‘risk-free rate’ implicit in ERP no longer holds, while interest rates are so low and bonds lack sensible anchor points at all maturities. Their task is now more difficult with the rise of the widespread ‘buy the dip’ mentality whenever markets head south. It prevents healthy small corrections periodically, while creating the right conditions for a big correction at a later stage. Pension plans are thus forced to perform a balancing act. While it is unwise to ignore the possibility of a big drawdown, it is also unwise to ignore the improving fundamentals of the global economy. Anything is possible. 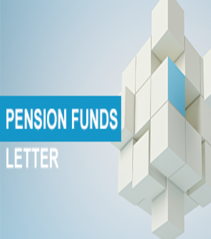 Pension plans, therefore, have to factor in these seeming opposites in their investment approaches by blending caution, opportunity and patience in the belief that risk premia are likely to materialise over a longer period. Hence, as markets have run ahead of themselves, longterm investing has gained relevance. Besides, investing in equities is an imprecise science over a period of a year or less due to regular irrational swings in market sentiment. Currently, for operational purposes, there are mild differences between three broad asset classes. 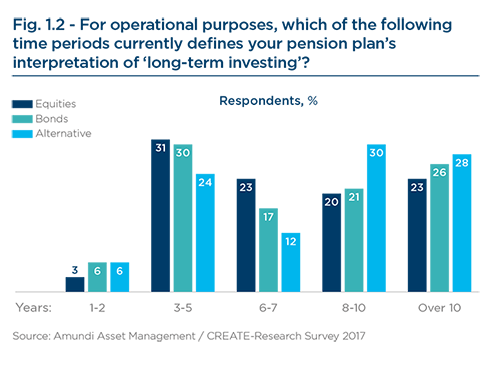 With equities, only 3% of respondents have a holding period of two years or less; 34% have a holding period of five years or less; and 66% have a holding period of six years or more. The shorter periods apply to cyclical and tactical strategies and the longer periods to value strategies. With bonds, the picture is similar: 6% have a holding period of two years or less; 36% have a period of five years or less; and 64% have a period of six years or more. The short duration bonds have smaller periods and the long-term ones have longer periods. With alternatives, 6% have a holding period of two years or less; 30% have a holding period of five years or less; and 70% have a holding period of six years or more. Tradingoriented strategies such as hedge funds and long-short funds have shorter periods; while illiquid strategies like real estate, private equity and infrastructure have longer ones. 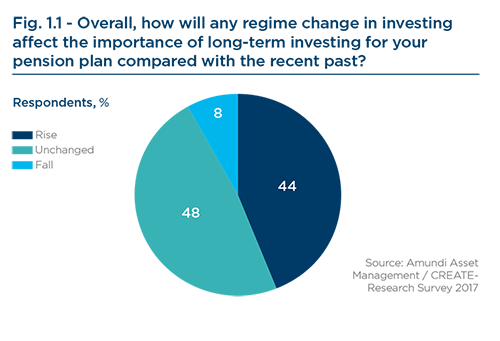 When asked whether lower portfolio turnover delivers better returns, our survey respondents replied as follows: Equities: ‘yes’ 60%; ‘no’ 16%, Bonds: ‘yes’ 50%; ‘no’ 22%, Alternatives: ‘yes’ 46%; ‘no’ 24%. Lower transaction costs are one factor behind these preferences. They average 45 basis points for an average pension plan. Another factor is uncertainty resulting from various shifts including the normalization of Central Banks monetary action and the rise of populism. They will most likely oblige pension plans to increase their holding periods, if risk premia take longer to materialise. The implied support for buy-and-hold investing does not necessarily mean hanging on to a position come what may. Instead, for equities, it means evaluating the long-term viability of a company on specific criteria and holding a position so long as these are discounted in the current stock price. If the actual price is higher than the discounted price, the stock may be sold and only repurchased when the situation is reversed. Such pragmatism also holds that asset class diversification is not the only way to avoid losses on equity investments during market stress. Longer equity holding periods too can allow these losses to be offset against subsequent gains as markets recover – so long as there is an exit strategy already in place to cope with big corrections. Longer holding periods can also allow compounding to work on dividends and enhance total returns. 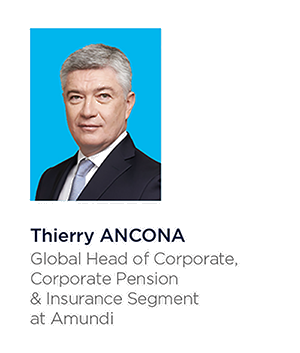 Amundi is the only player in Europe offering a multiemployer cross-border pension solution fully operational in seven European countries, soon rising to nine. 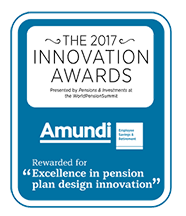 This solution emanates from an innovative project which has taken several years, enabling Amundi to accumulate a solid experience and inspiring feedbacks on pension funds’ needs. Europe’s pension system is changing. Life expectancy is increasing and fertility rates are falling. Moreover, people have more diversified careers, work in multiple countries and retire later. Local contributions towards the pension fund do not suffice anymore and governments need to intervene with additional payments. In response to these constraints, many European countries have moved toward the greater private provision of pensions in order to improve their financial sustainability. Efficient and international solutions are urgently needed, but the necessary transformation of the European market has been slow. “Although the IORP Directive came to life in Brussels in 2003, its operational implementation took several years. Only few countries, more open to cross-border plans, such as Luxembourg, have really supported pan- European pension funds,” says Xavier Collot, Director of Employee Savings and Retirement at Amundi. Ludovic Ducourtioux, Managing Director of Amundi Global Servicing in Luxembourg, adds: “IORP had a grand vision to go cross-border but this turned out to be too optimistic. The IORP Directive did not include a Distribution passport, like the UCITS Directive. It was designed to meet the needs of large companies only, not asset managers like us. Most of these multinationals developed a pension plan to meet their regional needs.” Developing a true cross-border retirement plan requires not only the right vehicle but also time, money and expertise that only few large corporates can afford. In addition, the company has to be able to manage several external providers in many countries, which can be cumbersome and costly. Large corporations, searching for simplicity and efficiency, need cross-border and fully customized pension funds solutions. In particular, they are looking for one-stop-shop solutions, which not only bring economies of scale but also offer a way to efficiently consolidate their local plans and outsource administrative burdens. In addition, employers aim to beneficiate from tailor-made support services, including the provision of a fully digital, highly secured and user-friendly platform to adapt very quickly to the specific needs of their clients. “We started to work on this project four years ago. Based on discussions with a series of large corporates, we felt that there was a strong need regarding the development of a new pan-European pension fund offer. Even if local social, tax and labor rules are complex in Europe, we structured a solution as simple as possible with a single entry point and a compartment by country fully compliant with the local regulations,” Mr Collot explains. In order to ensure a sufficient income during retirement, Germany intends to strengthen regulated company pension schemes and provides a new regulatory framework affecting Pensionskassen (staff pension funds) and Pensionsfonds (Pension funds) directly. The main objective is to offer company pensions to many more employees and to increase the benefit level – both under the responsibility of the Sozialpartnermodell and labor agreements. The new law becomes effective as from 2018 and the following years. Guarantees on interest rates and future benefits will legally not be allowed in the future. Only guarantees of paid premiums will be permitted. Instead of guarantees, target returns will be communicated. Existing pension schemes offered by companies with existing labor agreements shall be open to companies without existing labor agreements. Employees with low income will receive a 30% government grant based on yearly premiums between 240-480€ if the monthly salary is below 2200€ (increase from 2000€). From 2018 onwards, 8% of the social security contribution ceiling will be open to pension schemes at no tax expenses. (before it was only 4%). Companies have to grant 15% on top of the employee’s savings premiums, if employees transfer the premiums from their monthly salary to pension’s benefits at no social charges. This obligation starts in 2019 for new pension schemes and will become effective for old pension schemes as from 2022. The regulator and the government want to take into account the demographic evolution and at the same time consolidate the pension funds industry. It is effective as of January 1, 2018. The target retirement age for occupational retirement plans in the Netherlands will increase from age 67 to 68 (Effective January 1, 2018). An increase in target retirement age is automatically triggered by an increase in average life expectancy as determined by the Central Bureau of Statistics. Based on current mortality projections, the next retirement age increase is not expected before around 2025. When a member would leave a plan due to termination, the law used to permit pension funds to pay out small occupational pension entitlements (i.e., corresponding to less than EUR 467.89 per year) as a lump sum starting two years after the date of leaving. Higher pension entitlements would remain in the plan, unless members would expressly request the value transfer to the pension plan of their new employers. Members who would receive such a lump sum (which is taxed as income) had no obligation to invest it for retirement. Many employees in the Netherlands have accrued separate small pension entitlements with various employers, which in combination may be substantial. To help promote lifetime pensions, the government has introduced by 2018 an AVT system that gives pension funds and insurers the right to transfer terminating employees’ accrued pension entitlements (up to the aforementioned cap) to the pension fund or insurance of their new employers (if any). "After several decades driven by short-termism, we have observed since the Global Financial Crisis the rising of a “long-term awareness”, the perception that we are facing long-term challenges and that long-term investment needs are expending." "Investors on both sides of the Atlantic, having been preoccupied for several months, now have clarity on several fronts. The general perception is one of political risks having lifted; and we also note that the European economy is accelerating convincingly."